The titular Pokemon of this film, Jirachi! Isn’t it adorable? Jirachi – Wish Maker, 「七夜の願い星 ジラーチ」(lit. “Wishing Star of the Seven Nights: Jirachi”, officially “Wishing Star of the Seven Nights”) released in Japanese theaters on July 19, 2003 and came to American home video on June 1, 2004. 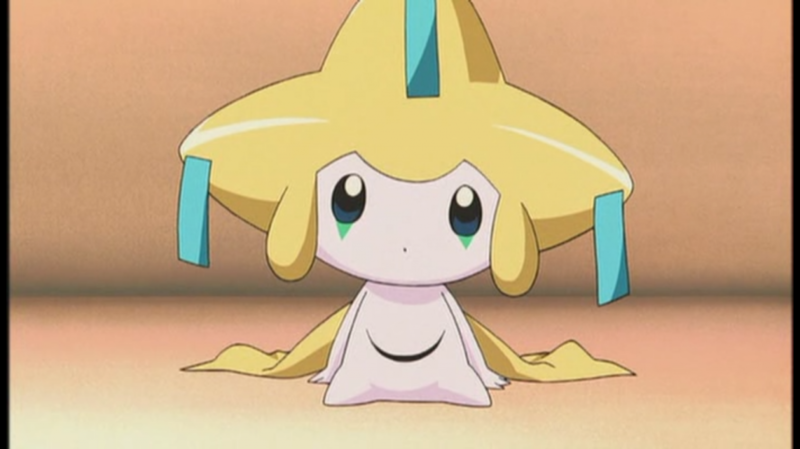 Jirachi – Wishing Star of the Seven Nights (hereby Jirachi) marks the first entry in the Advanced Generation series of films. To relate more closely with the television anime, the Advanced Generation series has two new companions accompanying Satoshi (Ash Ketchum) and Takeshi (Brock) in place of Kasumi (Misty). These two new companions are Haruka (May) and her younger brother Masato (Max). And hopefully this means that a new movie series will bring a revised take on the Pokemon movie formula. Let’s take a look. 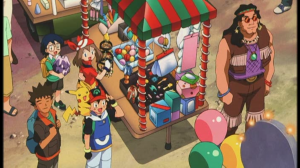 Satoshi (Ash Ketchum) and his friends, Takeshi (Brock), Haruka (May) and her little brother Masato (Max) are on their way to the Millennium Comet Festival. The Millennium Comet only comes once every thousand years and stays visible in the sky for seven days. The festivities include extravagant shows, amusement park rides, food, parades, fireworks, and much more. On the first day of the festival, the group pay a visit to The Great Butler’s Magic Show. Towards the end of the show, Butler’s assistant, Diane, appears on stage carrying a mysterious stone. 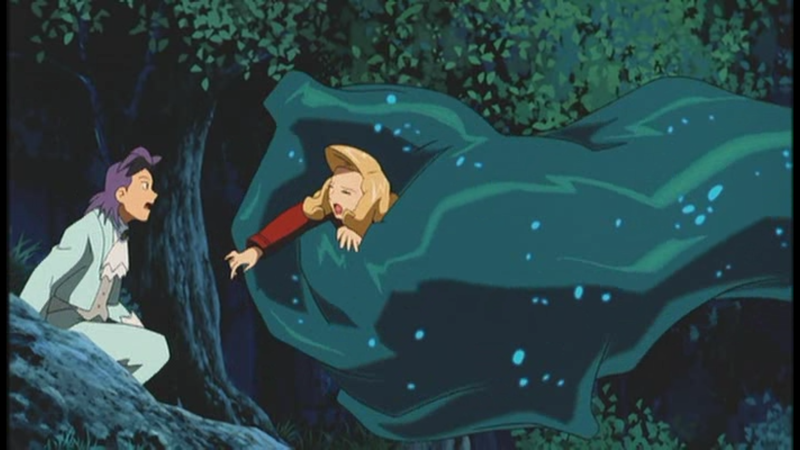 Masato begins hearing a voice calling to him from the stone and runs to the stage to ask Butler and Diane about it. Butler reveals that within the stone rests a Jirachi, a mystical Pokemnon said to have the power to grant wishes. Jirachi only awakes once every thousand years while the Millennium Comet is visible in the sky. In order to protect itself during that time, Jirachi chooses a kindhearted young boy to act as its partner until it returns to its thousand year slumber. Since Masato was the one Jirachi called out to, Butler gives Masato the stone containing Jirachi. That evening, under the light of the Millennium Comet, Jirachi breaks free of the stone. Masato and the crew quickly find out that Jirachi is intelligent enough to communicate via telepathy. Since Jirachi is said to be able to grant a person’s wish, they try asking Jirachi for various things. Jirachi granted Masato’s wish to have a lot of candy, but they find out that Jirachi doesn’t have the ability to grant a wish per-se. Instead, Jirachi’s true power is the ability to transport itself or any object to any location instantaneously. 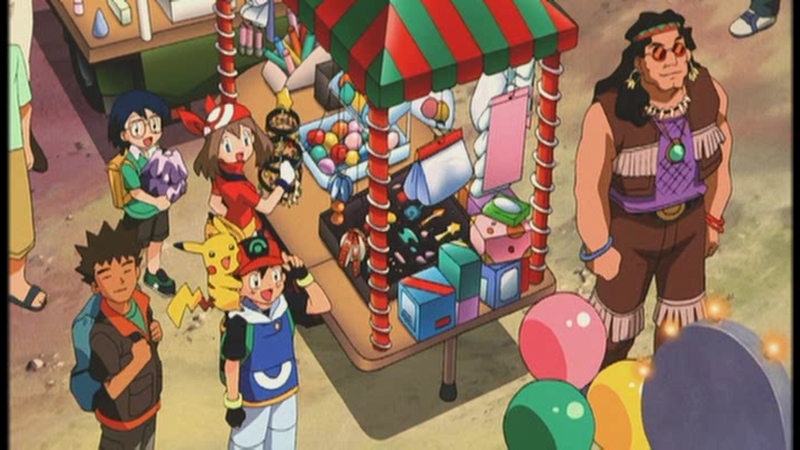 The following day, Masato goes off together with Jirachi to enjoy the festivities where the two grow incredibly close. That evening however, Butler sneaks into their camp and takes Jirachi back to his circus tent. There, Butler reveals that he is part of the evil Team Magma. Butler was originally a scientist for the team and came to them with a proposal to clone the ancient Pokemon Groudon using fossilized DNA. However, the experiment was a failure and Butler was kicked out of the organization. Convinced that he could still make it work if he had more power, Butler sought to use Jirachi to channel the energy from the Millennium Comet and use that power to resurrect Groudon. Masato, upon finding Jirachi missing, wakes up the rest of the group and they rush over to Butler’s tent. They find that Butler’s apparatus once again fails despite having Jirachi there to channel the energy from the Millennium Comet. Satoshi and his Pokemon successfully stop Butler’s attempts to recapture Jirachi and the four escape from Butler with thanks to Dianne. Dianne, though Butler’s assistant and childhood friend and love interest, wishes to stop his crazy plans since she knows Butler wasn’t always obsessed with power. 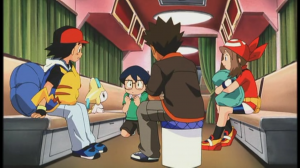 Using the bus that Dianne and Butler originally came to the festival in, the five of them begin a journey back to Jirachi’s original resting place, the Fauns Valley (Forina Valley in the English dub). Jirachi, thanks to channeling energy from the Millennium Comet into the earth there, created a lush environment rich in life and greenery. During the travel, Satoshi and Haruka both warn Masato that when they return, Masato and Jirachi will have to part, so it would be best for Masato to prepare for their parting. They finally reach Jirachi’s original resting place in a cavern at the bottom of the Fauns Valley and they watch as Jirachi prepares to enter back into its thousand year slumber. However, as Jirachi falls asleep, Butler appears in a blimp and captures the sleeping Jirachi attaching it to a new revision of his Groudon resurrection machine. Satoshi and Masato, with the help of a Flygon native to the Fauns Valley, pursue Butler and succeed in stopping his machine, but it unfortunately was too late. Groudon came back to life as a result of Butler’s machine, but because the process was prematurely stopped by Satoshi and Pikachu, the Groudon that was resurrected is an incomplete organism. In order to complete itself, it begins to indiscriminately absorb the living organisms of Fauns into its body to gather the energy it needs to fully revive its own body. Butler, seeing the grave mistake he’s made, agrees to work with the crew to stop this monster Groudon after Dianne sacrifices herself saving Butler from being consumed by the corrupt Groudon’s tentacles. Butler informs Satoshi and Masato that they can stop Groudon by using his machine, only this time in reverse. Rather than providing energy to Groudon, it will drain Groudon of its energy and feed it back into Jirachi. With the help of the Flygon from earlier, they succeed in reaching the machine despite Groudon’s interference and start the machine’s sequence in reverse. Groudon, sensing its energy being rapidly drained, makes one final effort to consume the machine before it disappears, but by that point it was too late. Jirachi had already regained much of its energy and uses its power to launch the Groudon into space, destroying it forever. With Groudon gone and Butler no longer seeking to capture it for his ambitions, Jirachi is finally able to take its thousand year slumber. It says goodbye to Masato and everyone one last time before it finally dozes off, returning to its stone cocoon until the Millennium Comet passes again. Butler and Dianne decide to stay in the Fauns Valley to catalog the biology of the land and restore the damage done by the corrupt Groudon. The two groups depart and the movie ends. Jirachi’s most prominent theme touches on the strength of bonds between Pokemon and humans. Though previous films touched on this idea, particularly Celebi and Latias and Latios, the theme was never as obvious as it is in Jirachi. I’ll spoil right now that this theme will drive all the rest of the Advanced Generation films. Obviously, showing off the bonds between Pokemon and humans is nothing new for the Pokemon franchise. Practically every episode of the anime features this theme in varying degrees as well. Perhaps the directors wanted to bring the films closer to the writing of the show. 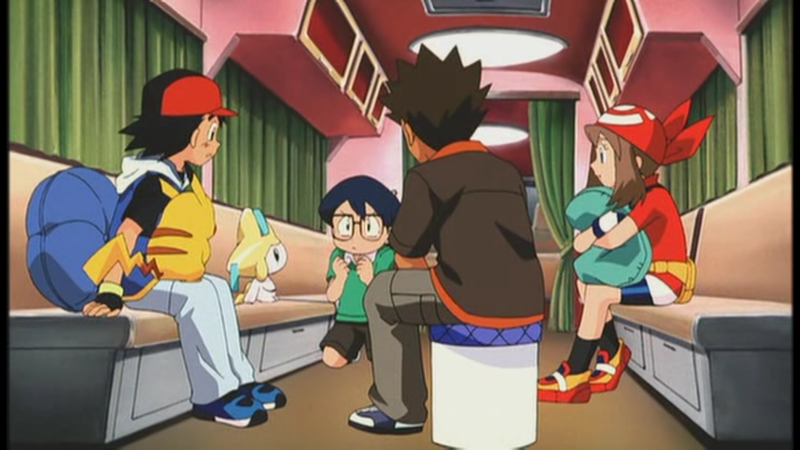 The crew sitting together with Jirachi trying to get it to grant their wishes. Masato is notably annoyed. In this film, they chose to depict the relationship between Masato and the titular Jirachi, an interesting choice considering that all previous Pokemon films had Satoshi in the spotlight. For the first time, we get to see one of Satoshi’s travelling companions play a key role in a Pokemon film beyond being a simple supporting cast member. Ignoring the blatant gender favoritism from the plot for the sake of convenience (why does Jirachi choose a young boy specifically rather than any young child? ), choosing Masato as the movie’s protagonist was honestly the right choice to make. Even when you only consider the movies, Satoshi and Takeshi are incredibly well-traveled and have raised numerous Pokemon of their own. Unlike them, Masato doesn’t have the experience of raising Pokemon on his side, nor has he been shown to be particularly close with any Pokemon in the television show. His excitement befriending Jirachi is only natural and something easily understood by the audience members, particularly the younger crowd. In addition, were it not for Masato and Jirachi’s building relationship, their heart-wrenching parting at the end of the film would’ve lost much of its impact. It had the same kind of impact as seeing someone lose their first love or their childhood puppy. Dianne pushes Butler out of the way before he is consumed by the evil Groudon. This was also the first time in a Pokemon film where the established villain is shown not to be an outright evil person. We know that Butler used to be part of the evil Team Magma, and he had evil motivations, but we find out that there’s a lot more to his story. Thanks to Dianne’s flashbacks, we learn more about Butler’s background and that there’s some compelling shading to his character. He captures Jirachi and tries to resurrect Groudon to secure a better life for him and Dianne, not just for bland, selfish desires of power and fame. Frankly — though his development is a bit cliche and cheesy — Butler is by far best-developed villain of the Pokemon movies. We finally have someone with justifiable actions, rather than one-dimensional evil like Vicious or Lion. My largest complaint with Jirachi is how little it feels like a movie. To be completely honest, if I didn’t know it was a Pokemon movie, I would have thought it was some lengthy TV special episode. The majority of the film features very mediocre animation. Though there are Pokemon fights early in the movie, the sequences are very stiff with little motion to them. They look like they’re ripped directly from a regular old Pokemon episode. In fact, it isn’t until the final quarter of the movie when Butler succeeds in reviving the corrupt Groudon when the quality of the animation escalates into something truly cinematic. The gang in front of a stand at the Millennium Comet Festival. A colorful scene, but nothing beyond television episode quality. I’m usually not one to rag on presentation, but in the case of a massive franchise series based off of a TV show, production values are key in differentiating your higher quality products. I voiced a similar complaint about Latias and Latios as well: There’s just not enough spectacle. Beyond a few select sequences such as the Millennium Comet Festival preparations and the battle against the corrupt Groudon, there wasn’t anything visually magical about Jirachi. Though I’ll give credit to Jirachi for making some good calls in its narrative, it loses muchos puntos for failing to deliver an immersive movie experience. I can see that they were trying to use the design philosophy of the anime within this film, but I think they took it too far. Jirachi ultimately ends up feeling like a lengthy special episode that was mislabeled as a movie. That isn’t to say that Jirachi is a bad watch at all. It’s cute fun and has many some great plot and character moments. Just don’t watch it expecting a full-fledged Pokemon film event in the vein of Mewtwo or Celebi.